Right-wing media, pro-Trump internet trolls, and fake news purveyors are boosting a report from a right-leaning journalist in a way that suggests former FBI Director James Comey might have intentionally leaked classified information to The New York Times. 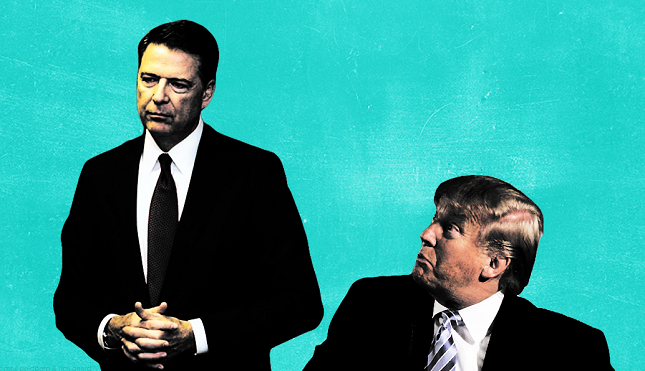 The report presents already-known information about Comey’s memos that recounted his interactions with President Donald Trump. Politico also reported that the source that passed along the memo to the Times confirmed that it did not contain classified information. A number of right-wing outlets quickly reported on The Hill article, hyping it as a “revelation ” that could suggest leaking of classified information on the part of Comey. The Daily Caller , The Gateway Pundit , Washington Free Beacon , Hot Air , Townhall , InfoWars , Breitbart , New York Post , and RedState  all reported on it. Fringe  internet  trolls  also boosted the story, and fake news  purveyors quickly followed suit. Fox News’ chief intelligence correspondent Catherine Herridge reported  that “a legal source close to the matter tells Fox News at least some of the material is considered law enforcement sensitive or possibly classified. The Hill newspaper reports some records documenting those nine conversations with the president were marked secret or the lower level classification known as confidential.” Trump’s favorite morning news show, Fox & Friends, reported on the story multiple times  throughout the three hours the show aired. The story was also tweeted through the show’s Twitter account, which Trump retweeted. This issue came up during Comey’s June testimony, at which point Comey made clear that the memo he gave to his friend to leak, documenting a meeting on Feb. 14 of this year, was not one that included classified material. "Jim Comey never gave me a memo that was classified; and the memo whose substance I passed on the Times has never to my knowledge been classified," Daniel Richman, a longtime adviser to Comey and a Columbia University law professor, told POLITICO. Whether that particular memo has been retroactively classified will be a key question as Comey faces attacks from President Donald Trump and his supporters, who are now accusing him of mishandling classified information. At least one of Comey’s memos remains unclassified, the source with knowledge told POLITICO. 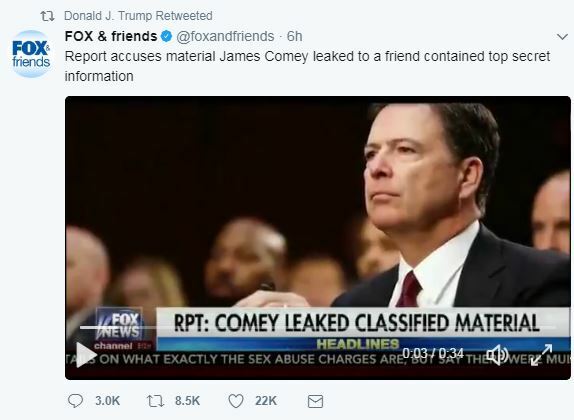 UPDATE: Fox & Friends offered a correction to their original segment, tweeting that “Comey’s memos did not have top secret info.” Fox & Friends said  they will address their erroneous report on Tuesday morning.